Melissa Mariner-Loos, who lives in Warminster, PA, first saw Reed, a Pit Bull, on Petfinder in 2005. Little did she know then that the stray pup, who was barely weaned and had a gaping wound in his shoulder, would have a profound influence on her life. Caroline County Humane Society in Ridgely, MD, listed him on Petfinder. The staff there had patched him up, but he was still in the shelter when he was six months old. His story and photo set Melissa in motion. She went to Maryland and adopted him. She knew how much discrimination there is against Pit Bulls, and yet here she had the gentlest, best little pooch she could imagine. As she found out more, she decided to get into Pit Bull rescue and volunteered as a foster parent for several groups. And then it seemed a natural transition into starting her own rescue group. She named it Bella-Reed Pit Bull Rescue, after Reed and another of her “pitties,” Bella Blue, both of whom serve as the rescue’s mascots. Hers is not a brick-and-mortar shelter, but instead relies on foster homes to care for the rescued dogs, which helps them acclimate to family life. 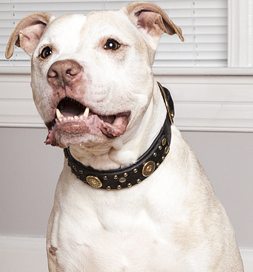 Part of the rescue’s mission is to educate people about the breed. On the rescue’s Facebook page, she writes, “I can’t imagine doing anything else in life that makes me this happy.” The rescue has placed more than 70 dogs since it began. “Oh, did I mention I have also become a foster failure with one of my own rescue’s fosters? Yes. I adopted Hershey of the S’mores Pups,” she added. She also has a Pit Bull named Daphne. One more life saved by a Pit Bull enthusiast, and Melissa attributes it all to Reed for saving these lives and changing many minds about Pit Bulls.